A grain-like plant that is not actually a type of rice, but an aquatic grass bearing edible seeds that grows in wild marshy areas of fresh water lakes and rivers. Wild rice is native to the northern waters of Minnesota, parts of Wisconsin, and adjacent areas of Canada. To many Native Americans Wild Rice is referred to as Mahnomen or Manomin which means good berry. The native species of lake rice is hand harvested, making it quite expensive due to the slow and labor intensive process to harvest the rice. Cultivated Wild Rice however, which grows in controlled bodies of water is machine harvested. Cultivated rice, which is commercially produced primarily in the states of Minnesota, California, Idaho, and Washington, depends on a hybrid species of Wild Rice that is grown in sections of water referred to as controlled paddies. The Wild Rice raised in controlled paddies is less expensive than lake rice since it is easier to harvest in paddy waters that are maintained for growing this rice. The controlled paddies are flooded when ready to grow the rice and drained when ready to harvest it. Unlike the lake rice which drops its kernels to re-seed itself, cultivated Wild Rice is harvested by cutting the grass stalks off when it is picked which stops the plant from growing again. The cultivated Wild Rice plant is then replanted after each harvest to begin the growing process over again. Approximately 80% of the rice produced in the U.S. is grown within controlled paddies and is referred to as paddie rice. In most states containing lake rice, only a small amount, approximately one-tenth of the Wild Rice harvested, consists of the pure or native species that is hand-harvested lake rice. The hand harvested lake rice is gathered by individuals who use canoes or similar sized boats to paddle through the lake rice fields. As a lake harvester paddles through the stalks of grass containing the rice seed, two wooden sticks or paddles are used to harvest the green rice. One stick is held in one hand to bend the stalk over the boat while the other hand uses the second stick to gently shake the stalk in order to release the raw kernels so they drop into the bottom of the boat where they accumulate prior to bagging. Wild Rice grains harvested from inland lakes such as in Minnesota or Canada, provide varying lengths and colors of rice, which is a common trait as the rice often varies in characteristics from one body of water to another. The grains of lake rice are typically longer than long-grain varieties of white rice, averaging ½ to ¾ inch in length. The color may range from shades of yellow, tan, and brown, to almost completely black. The grains of Canadian Wild Rice tend to be longer and are often referred to as jumbo Canadian Wild Rice. Some grains of Canadian Wild Rice may reach lengths of one inch or longer. Cultivated Wild Rice, which is grown in controlled paddies, is the type most commonly found in food stores. This rice is less expensive as well as more consistent in length and color than lake grown Wild Rice. After harvesting lake rice, the green kernels are typicaly sun dried for several weeks in stacked piles where the rice goes through a lengthy fermentation process which darkens the color of the rice. After being fermented, the rice is then smoke-cured by parching it over fire, gas or steam heat. This process dries the Wild Rice so it can then be placed in threshing drums to loosen the chaff from the parched rice so it can be winnowed away in order to remove it from the kernel. Some kernels of cultivated Wild Rice may become nearly black in appearance after drying while lake rice generally remains lighter in color. However, some varieties of lake rice may be lighter colored due to the processing method used when harvesting the rice, which lengthens the time the rice remains in the threshing drum. The purpose of this procedure is to dry the rice and slit it as it is hulled to remove as much moisture as possible in order to provide a kernel that will not take as long to cook when being prepared for a meal. Wild Rice has a very pleasant chewy texture and a distinctive nutty and natural flavor with a smokey overtone. The flavor of lake rice can vary from one lake to another and sometimes from one area to another in the same lake. More than half of the Wild Rice that is consumed is blended with other types of rice that are less expensive, however Wild Rice has such a distinctive flavor that a small quantity is sufficient to provide adequate flavor to the rice blend. Wild Rice can be served as a side dish, becoming a tasty alternative to potatoes or white rice. This variety of rice is also a common ingredient for use in soups, casseroles and steamed vegetables. It adds flavor to tossed salads and it is one of the best accompaniments for poultry and fish. To make a bag of uncooked Wild Rice last longer, combine it with brown or white rice when making a side dish of rice. 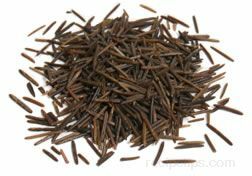 The various grades of Wild Rice are as follows: Giant or Long Grain - this grade is the best quality and the longest in length with each rice kernel measuring approximately 1 inch in length. Fancy or Medium Grain - with lengths that range from 1/2 inch to 3/4 inch, this grade of rice is slightly shorter than the Giant or Long to achieve this grade ranking. Select or Short Grain - kernels that are smaller in dimension, both width and length as well as broken and unbroken are included in this grade. This grade will be the least expensive and is still a good choice for many recipes not requiring the finest grade or presentation. To store Wild Rice, use an airtight container placing it in a cool dry area where Wild Rice will keep almost indefinitely. When cooked, the rice should be refrigerated and can be kept for up to a week. Naturally grown lake rice cooks faster than cultivated Wild Rice since the bran has been removed in the hulling process. Typically, a lake rice will cook in 30 to 45 minutes depending on the quality and type of rice. Cultivated rice which has the bran layer still on the kernel, requires approximately 1 hour or slightly longer to cook. Available in most large food stores as well as in gourmet and specialty shops, Wild Rice is one of the most nutritious grain-like foods on store shelves.